Eye Tests for all ages from Glenns Opticians, Liverpool Road, Great Crosby. What happens at an eye test? Can you tell me about your medical history? Are you having any problems with your eyes or vision? This is one of the first tests to be performed in a comprehensive eye examination and it will give your optometrist an idea of what kind of prescription you may need. It gives a good starting point for the other tests. The autorefractor is a computer that works on a similar principle to the autofocus on your camera and gives the optometrist an idea how strong your glasses need to be without you speaking. 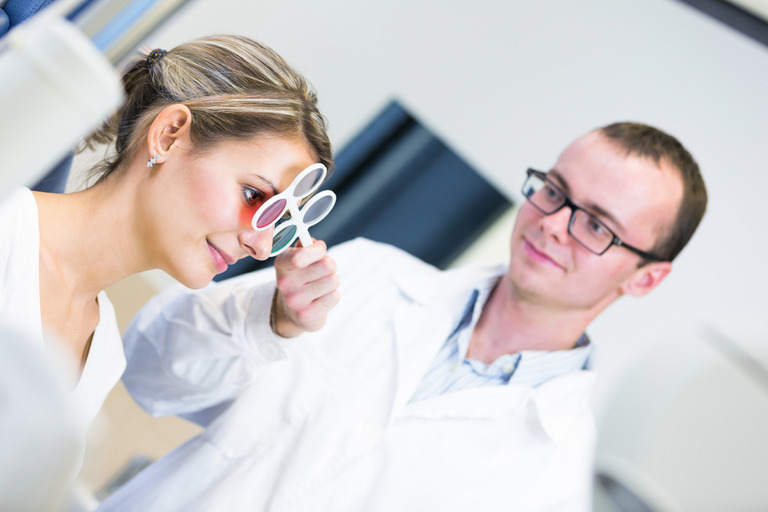 This is the part of the examination where the optometrist checks the health of the back of the eye (retina). At Glenns this is now done by a machine called an OCT which is an upgrade from digital photography. This gives us a permanent record that can be compared at each visit and measures tiny changes in your eye over time to 1/1000 of a millimetre at every visit. Many general conditions such as high blood pressure and diabetes can sometimes be detected as well as eye diseases like glaucoma, cataracts and macular degeneration. This technology is used on board the International Space Station to check the health of astronaut’s eyes and now you can have your eye health checked in exactly the same way here on planet Earth! This test fine-tunes the prescription estimated by the autorefractor. An instrument called a phoropter will be put in front of your eyes and you will be asked which of each choice of two lenses looks clearer. 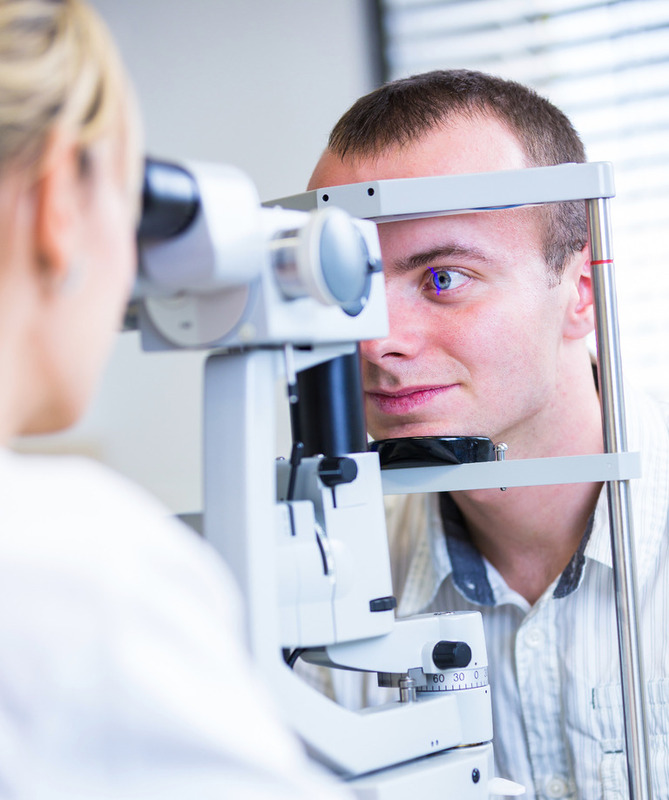 Based on your answers, the optometrist will be able to determine which exact prescription is best for you. Refraction tells you how long-sighted, short-sighted, astigmatic or presbyopic you are. The visual acuity test is the one most people think of when they think of an eye exam. You will be shown an eye chart and asked to say what’s on it. Adults are usually shown letters of the alphabet, while young children are often shown pictures. The Amsler grid is a pattern of lines in a square check formation, with a spot in the middle. While staring at the dot, you may notice variations in the regularity of the lines. This tests your central vision and can be used to detect the onset of age-related macular degeneration. This test consists of lights flashing in the periphery of your vision while you stare at a light in the centre of your field of view. Also known as the perimetry test, it measures your peripheral vision and can be used to detect the onset of open-angle glaucoma. For this test, your eyes will be alternately covered while you focus on a distant object. 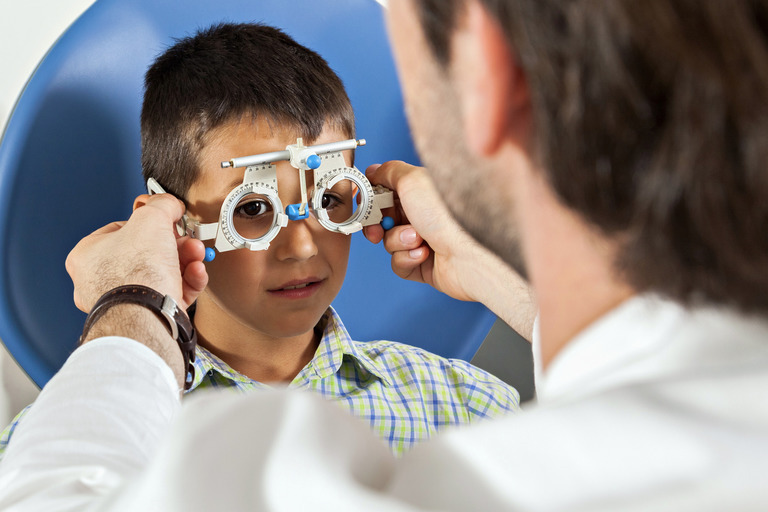 By looking at how much each eye has to move to focus on the object, the optometrist can detect strabismus (eye turn), which can lead to amblyopia (lazy eye), poor depth perception and other conditions. The slit lamp examination is rather like looking right into your eyes through a powerful microscope. In fact, the instrument used is called a biomicroscope and it allows your optometrist to get a close look at the internal structures of the eye. The eyelids, cornea, iris, conjunctiva, retina, optic nerve and macula are among the things that can be seen with a biomicroscope, and cataracts, macular degeneration, diabetic eye disease and corneal ulcers can all be detected using this test. This measures the pressure inside your eye, which is also called intraocular pressure. It is used to test for glaucoma and often involves a non-contact tonometer, also known as the "puff of air" test. All this involves is having a puff of air directed at your eye. The machine will calculate your intraocular pressure on the basis of your eye’s resistance to the air. It is completely painless. The pupil (the black spot in the middle of your eye) is effectively the hole through which your optometrist looks into your eye. The larger the pupil, the bigger the "window" is to look through. Because of this, you may be required to take some dilating drops; these usually take about 20-30 minutes to start working and will probably make your eyes more sensitive to light. It is advisable to take along a pair of sunglasses to your exam as this sensitivity can last for several hours after you have left the practice. The usual test for colour blindness involves looking at numbers formed of dots against a background of dots of a different colour. These pictures are called Ishihara plates. People with normal colour vision will see the number as it is meant to be, while people with colour vision problems may see a different number (for example a 3 instead of an 8), or even no number at all. 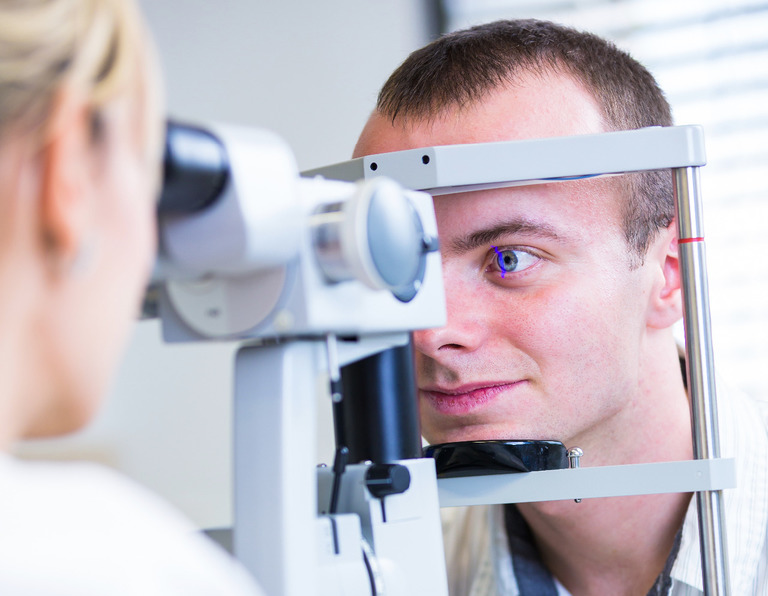 These are the most common tests performed in an eye exam, but there are others and you shouldn’t be alarmed if tests are performed on you that haven’t been mentioned here. It is also important that you’re honest in the answers you give to any questions the optometrist asks; concealing or even just playing down problems may make it more difficult to make a proper diagnosis.